Getting Microsoft Windows Server 2003 up and running, either as a standalone or as part of a multi-site, multi-server network is a formidable task for anyone. 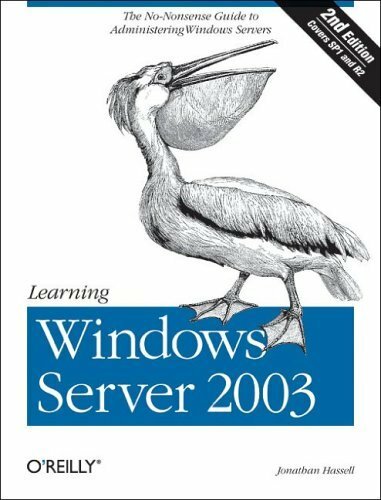 O'Reilly's no-nonsense guide, Learning Windows Server 2003, 2nd Edition, gives you just what you need to get the job done. It provides you with the nuts and bolts for installing, configuring, securing, and managing Windows Server 2003-plus, it has been completely updated for Service Pack 1 and release R2. The book also features step-by-step procedures and discussions of complex concepts such as patch management, Active Directory replication, DFS namespaces and replication, network access quarantining, server clustering, Group Policy and other security tools, and IIS6 web server. Whether you're an experienced system administrator or one who's just beginning, you'll turn to this practical guide again and again when you need to understand the massive product that is Windows Server 2003.